For example, check out this adorable 3D Hot Air Balloons Mobile. It’s a fun, easy starter project and makes for the perfect baby shower or toddler’s birthday gift (and can you believe it's made with felt?). And what’s a gift without a card? 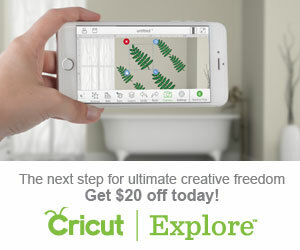 Cricut has an incredible selection of card examples made with Cricut Explore machines. There’s even a whole selection dedicated to everything baby, which is where I came across this cute baby shower card. There are an unbelievable number of project examples in the Design Space, which are categorized by type (e.g. baby, holidays, home décor, school, food, etc.) and by level (easy, moderate, and advanced). You can also find a ton of great ideas for projects on Cricut's Blog and Pinterest page.